Happy Saturday!! I have another amazing piece from Shop Impressions Boutique to share with you! 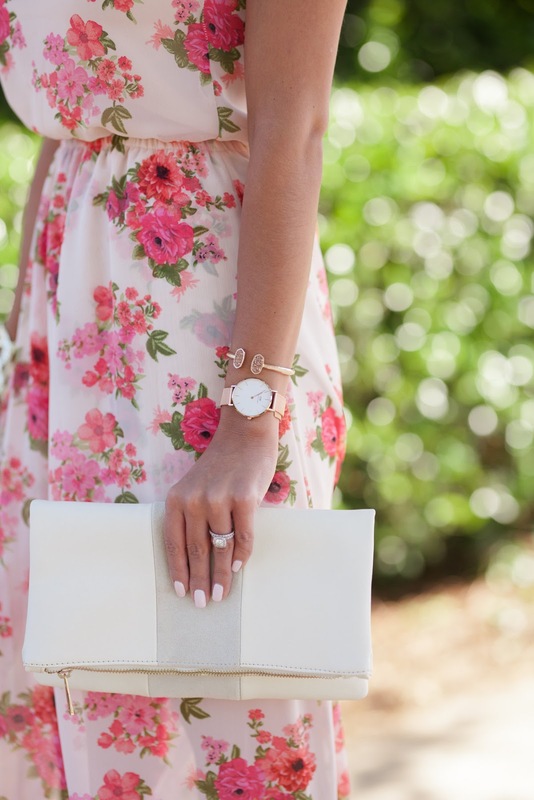 How amazing is this floral maxi dress? **Insert ALL the heart eyes here** I love the slit on the side and the low back. It is just absolutely gorgeous. What I love most about this dress is that it kind of reminds me of a Show Me Your Mumu style dress but for over HALF the price. It's only $59!! We all know that I love my Mumu so when I saw this dress and saw the price I knew that I had to have it. This dress would be absolutely perfect for a Summer wedding. I mean you just couldn't go wrong with it. I paired it with my new striped clutch, my ankle strap heels, and some of my rose gold/gold accessories. This dress is also for all of you tall girls out there. I am 5'7" and always have a really hard time finding a maxi dress that is long enough for me to wear heels with. And this one is perfect!! My heels looked perfectly paired with it. Trust me when I say you NEED this maxi in your life. How is everyone's weekend going so far? I am so happy that it is Mother's Day Weekend. My mama is in town with me and we are having the best time. We were going to go to Carowinds today (I am a theme park junkie) but it is really cloudy and kind of chilly so I think we are just going to go shop at South Park Mall instead. I am SO happy with that option ;) Hope you all have a wonderful weekend! That floral dress is STUNNING on you! Hope you had an amazing weekend with your mama! I love this dreamy maxi dress...it is really soooo pretty!!!! And even better to wear with heels! I have that problem too lol. This floral dress is really pretty! I love the heels you paired it with too!